I know I said last week I was going to be pretty quiet the next few weeks. It's because I didn't expect to have time to post, due to family holiday celebrations. My wife's mother and my family all live close enough to us that we spend time with both families over the holidays. We alternate, though. One year, we spend Thanksgiving with my family and Christmas with her mother; the next year, we spend Thanksgiving with Steph's mother and Christmas with my family. When we don't have Christmas with the family, we celebrate with the family on a different day in December. For us, it was last weekend. So I already have most of my presents for the year. I suspect that my parents struggle to find good gifts for me, which is why I have an Amazon Wish List. And the usually buy off of that list. The first, you probably have stashed somewhere. Well, a version of it, at any rate. But, until last weekend, I've never owned a copy of Monopoly. We had one in the house when I was a kid, but I never felt the need to own it. Until this edition was released. I hope that each of you gets everything you need and a reasonable selection of what you want. Not just for Christmas, either. Next weekend, I'll be celebrating Christmas with my Mother-In-Law, and so I will almost certainly not have time to sit in front of a computer, so I will remind you now: New Year's Eve. Phoenix Games. Be There! 5:00 PM. $5 or $5 in value of food for the potluck. This year, if you don't already have New Year's Eve plans and you're going to be in the greater Seattle area, you may want to consider joining us at Phoenix Games for our annual New Year's Eve celebration. I'm not sure what time it all kicks off, but I'll be there after my annual anniversary dinner with my wife (generally around 8:00). I also (as of this writing) don't know how much it'll cost. Once I have that information, I'll update this post with that information. If you have questions, contact the store directly either via their Facebook page or by using a telephone. Or by stopping by to spend some money and chat with Brian. But it's going to be a ton of fun. People. Food. Games. It's a kid-safe and alcohol-free environment. And the games will continue until the week hours of the morning. In a related note, I'll be taking the next few weeks mostly away from the blog. I'll probably throw some holiday greetings up next week and some New Year's greetings up the following week - but I'm preparing to play some games. UPDATE: Gaming starts around 5pm. Instead of just charging $5 per head, you should either bring about $5 worth of food for the potluck per member of your party or $5 per head or some combination thereof. I own a lot of games. Probably too many, but you didn't hear that from me. But I rarely game in my home. Most of my gaming is done on Wednesday evenings at Phoenix Games in Mukilteo. Now, Brian has a good library of demo games and store copies on-site. And the Wednesday crew is allowed to (and does) make use of that library. But Brian rarely has (for example) expansions as part of his library. So players who want to play (for example) 7 Wonders with the Leaders expansion need to bring their own copy. No-one has an infinite trunk in their car. So I'll never have room for every game I want to play at all times in the car. It just doesn't work like that. I can fit about thirty games the size of Ticket To Ride in the car. And a mixed bag of other-sized games. So I have to prioritize and arrange the car. My number one most important priority for games in the car is "Do I know or suspect that folks in the group will enjoy the game?" Because if I bring a game that no-one likes, I've wasted space in the car and some of our limited gaming time. There are games in the car that I'm not a fan of, but other folks I game really like. New games have priority. Playing games at Game Night helps Brian sell more copies of those games. But I have to be careful not to pass the point of, "I don't need to buy it. Eric has a copy," with some of these games. Games that can hold more players tend to get higher priority, too. I don't play many two-player games on Wednesdays, and those that I do play tend to be fairly fast-playing. Beyond that, it's "What else can I fit?" I have games from GenCon that haven't hit the table on Wednesdays yet. Like Madame Ching. It's not a bad game. There are just games we want to play more often. Lately, the group has wanted to play Fist of Dragonstones. I got it to the table the week after Alex went back to France (sorry, my friend). And I remembered after the first game why it stopped hitting the table. It's not because it's a bad game (because it really isn't). It's not because it's un-fun (because it isn't). It's because I'm so very bad at it. So. Bad. In the last three weeks, I've played it four times and scored zero points. In general, I'm okay with losing at games. I have no problem not winning. But when I can't even get on the board, I get frustrated and look for other games to play. The group likes it, though, so it'll stay in the car for now. This post is more about people and friends than it is about gaming, because that's where my head is right now. One of the things I love about gaming is the people. Which is odd, because (in general) I really hate people. Through gaming, I've met some really amazing people. But sometimes, you just need to go to war. One of the really awesome people I've met in the last few years is Jason Paul McCartan, who is the man behind Infinibadger Press (buy his stuff! It's awesome!). For about a year, now, the Badger and I have been engaged in a ruthless #PonyWar. I don't remember how the war began, but we've been sending My Little Pony-related things as gifts to one another. Because neither of us is Bronies. It started small - Stephanie and I sent him Dr. Whooves. Because he's a massive Whovian, so he wouldn't be able to outright destroy it. It was a success! A hit was scored! From there, it's escalated. Slowly but surely. Bit by bit. He sent us a plush MLP figure. We sent him a comic book. And a Dr. Whooves T-Shirt. But this year, I decided I wanted to win this war. So remember that link to Infinibadger Press up there? Scroll down a bit and look to the left. You can see their logo. It's a pretty simple logo. 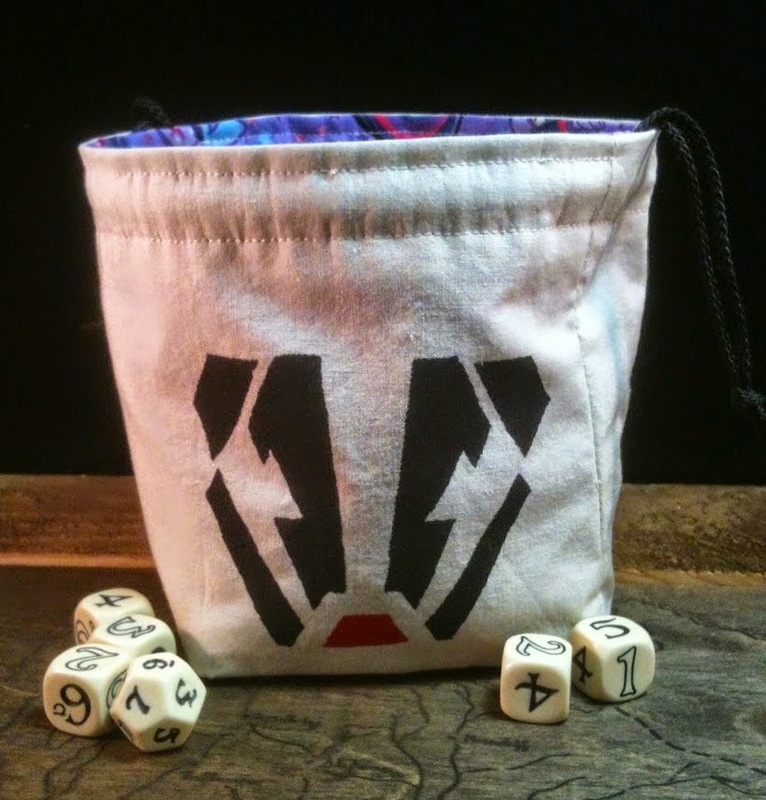 So I don't know if I've mentioned Greyed Out dice bags before here or not. If I haven't, then it's a massive oversight. It's run by another of the awesome people I've met through gaming. And he makes really good dice bags. And does custom work, including silk-screening. That's right: It's lined with My Little Pony fabric. And it's reversible (not that I can see the Badger reversing it any time soon ... ). And it turned out more spectacular than I had anticipated thanks largely to Greyed Out's good eye for color (I just told him I wanted the Infinibadger Logo on it and MLP fabric as a lining). And it went exactly according to plan. I even asked the Badger to record video of the gift opening. And he did. You can tell the point at which he spotted the lining, too. He is already plotting his revenge. Through a perfect storm, I somehow managed not to have a post up this morning. I'm not walking away, I just haven't been in front of a computer (other than at work) for more than a few minutes at a stretch for a few weeks.